The effect of dramatic reductions in government-sponsored language students – notably those from Saudi Arabia and Brazil – continues to felt among Intensive English Programmes (IEP) in the US. The latest enrolment survey data highlights another year of sharp enrolment declines in 2017 with a majority of centres anticipating further reductions through 2018. The Institute of International Education’s annual Intensive English Programme Survey was released last week. Drawing on reporting from 424 higher education institution-affiliated and independent IEPs throughout the US, it finds a 20% reduction in ELT enrolments from 2016 and 2017, and a corresponding 20% drop in student weeks over the same period. This means that starting from the recent-year high in 2015, IEP enrolments in the US have fallen off by 35% over the last two years, while student weeks have declined by nearly 40% between 2015 and 2017. This has also had the effect of reducing the percentage of ELT students in the US as a proportion of total foreign enrolment in US higher education. Historically, total ELT enrolments have tracked around 4% of international enrolment in higher education, but, as of 2016/17, that proportion has dipped to 2.8%. 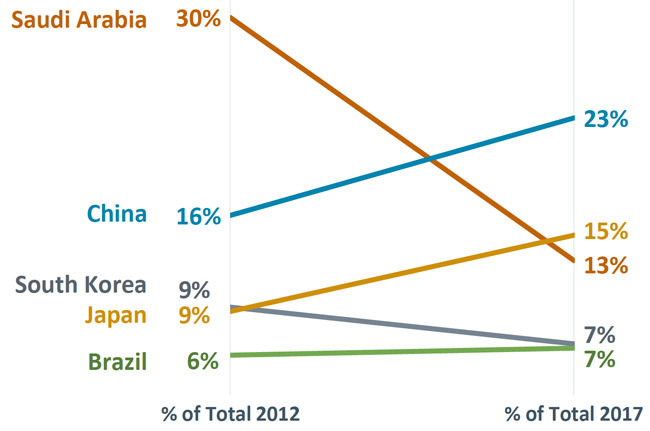 As the following chart reflects, the dramatic decline in Saudi student numbers has played an important part here. Saudi Arabia remains in the top five senders for US IEPs, but its share of enrolment has dropped considerably since 2012. Saudi enrolment in US IEPs has been heavily impacted by changes in the long-running King Abdullah Scholarship Programme (KASP). In the timeline below, we see the rapid expansion of Saudi student numbers in US English programmes from the inception of the KASP in 2005 to a high point in 2015. In 2015, however, we also began to see the first real contractions for KASP when the term of funded language study for Saudi students was capped at a maximum of six months (whereas previously many scholarship students may have enrolled with an IEP for a year or more). The effect of this policy is apparent in the chart above with the first dramatic reduction in Saudi numbers between 2015 and 2016. This scholarship funding was further reduced over 2016 and 2017, resulting in continuing declines in the number of Saudi students in the US. 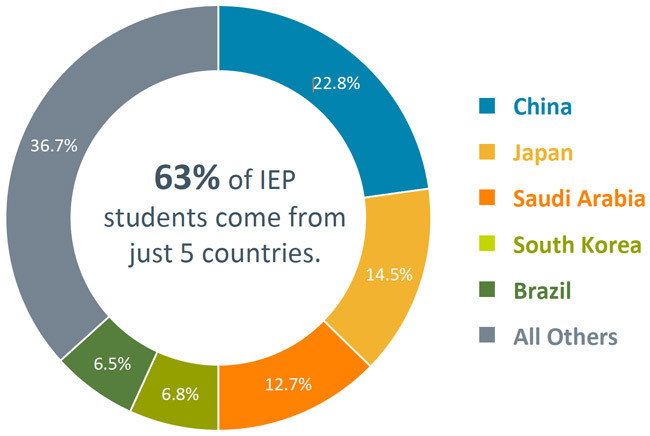 As this summary indicates, nearly two-thirds of all IEP students in the US came from the top five sending markets. Also released last week, a new flash survey of English USA members finds that six in ten reporting IEP centres recorded further enrolment declines as of spring 2018. Nearly half expect to see some additional reduction in student numbers during the key summer season, and more than a third (35%) are projecting decreased enrolment for fall 2018 as well. The English USA member survey also reinforces that IEPs across the US are taking a number of steps to counter these challenging enrolment trends, ranging from programme or staff restructuring to the introduction of new study options and increased investment in recruitment marketing. This entry was posted in Higher Education, Language Learning, North America, Regions, United States and tagged postgraduate student recruitment, US ELT, language schools, Intensive English Programs, English language programmes.